take on - Tom is ready to take on many new challenges. take over - I will take over as the teacher. take up - I will take up dancing. take in - We cannot take in any more guests. take apart - I will take apart the puzzle. take after - Allen takes after his brother. take around - Carlos will take around his dog. take away - I need to take away your hat. take off - Let's take off for Alaska. Each of the above two-word combinations functions as a single unit of meaning. 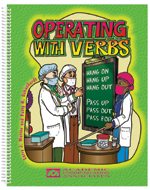 These phrases are likely to be difficult for students with language disorders and individuals who are learning English This book helps students learn two-word verbs that are critical for success in school and in social contexts. The activities in this book can also be used to facilitate the development of verbal expression skills as students use language to create sentences, define words, and tell stories. Reproducible pictures and worksheets are included.